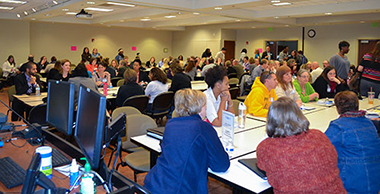 More than 150 school leaders, law enforcement officials and representatives of government and community agencies gathered at UNCW's Watson College of Education (WCE) on Thursday, December 11, to hear regional experts including Chief District Court Judge J.H. Corpening II and District Attorney Ben David discuss programs underway to stop the School to Prison Pipeline. "Zero-tolerance policies introduced in the 1980s with the War on Drugs led to a rapid escalation of incarcerated youth in the United States," Judge Corpening said during his keynote address. Of the 10.2 million people incarcerated in the world today, nearly a quarter are in the U.S., "and many of those impacted are school-aged children," he said. 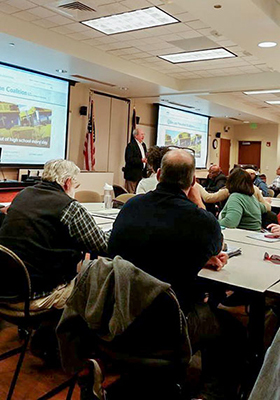 New Hanover County (NHC) is working to reverse the trend through a collaborative effort involving schools, law enforcement, community agencies and the courts. The goal is to put positive behavioral interventions in place and overhaul the discipline policy in area schools. "School suspensions and referrals to law enforcement have increased dramatically in recent decades, yet there is no research anywhere that shows that suspensions have a positive impact on behavior," Corpening said. "Instead, they have led to an increase in high-school dropouts and youth incarcerations." The approach underway in New Hanover County is modeled after a highly successful effort initiated a decade ago by Judge Steven Teske in Clayton County, Georgia. Corpening met Teske at a 2012 summit in New York City, an experience that he says changed his life. When Corpening returned to Wilmington he presented the model to New Hanover Schools Superintendent Tim Markley. Markley immediately agreed to Corpening's proposal to launch a similar initiative here, Corpening said. Janna Robertson, a professor at the Watson College and contributor to the New Hanover County Inter-Agency Collaboration, said the level of commitment from leaders throughout the community has been amazing. Robertson has been involved in similar initiatives across the country that were not successful due to interagency competition. She said the cooperative attitude here gives the county a distinct advantage in efforts to turn the tide for the region's youth. District Attorney Ben David cited the massacre at Columbine High School on April 20, 1999, as the event that triggered a crackdown on youth violence and contributed to what is now called the "School to Prison Pipeline." It will take a continued concerted effort by school administrators, public officials, mental health experts, law enforcement, the courts and the business and broader community to initiate positive, preventative measures that stop the pipeline, he said. David mentioned the Nourish NC Backpack program, Watch DOGS (Dads of Great Students) and the Blue Ribbon Commission's Prevention of Youth Violence initiative as examples of successful local programs. He said New Hanover County is leading the state of North Carolina in diverting students from the juvenile court system through the introduction of Teen Courts, and he encouraged attendees to learn about Hometown Hires (http://hometownhires.com), a strategic alignment of public, private and non-profit sectors to cultivate employment in the Cape Fear region. Hometown Hires is a new initiative that has the potential to be "a game-changer," David said. Through the program, the United Way provides support to individuals with past non-violent offenses seeking gainful employment. Vertex Rail, which recently announced creation of a new manufacturing facility in Wilmington, will hire 10% of its employees from Hometown Hires, David said. Other presenters at the event were Judy Stubblefield, Behavior Specialist, NHC Schools; Kathy Stoute and Teresa Huffman of NHC Community Justice Services; Robert Smith, professor at WCE; Kayce Smith, Teacher of the Year, Brunswick County Schools; and David Hand, social worker at Laney High School. Following formal presentations, event presenters led roundtable discussions on bullying prevention, positive behavior interventions, mental health services and other program initiatives. Additional discussions were led by Larry Bonney, an ex-FBI agent and leader in NHC's Safer Schools and Youth Violence initiatives; Clifford Barnett, pastor of Warner Temple AME Zion Church and a leader in local faith-based initiatives to stop gang warfare and protect youth; and Jana Jones Halls, executive director of the Blue Ribbon Commission. The final slide in David's presentation was a photo of a lighthouse. In his concluding remarks the D.A. thanked UNCW "for being a beacon of light for this region today." Addressing the audience gathered to work together on behalf of the youth in the region he said, "We're on to something special. Let's keep this going." The Dropout Prevention Coalition in collaboration with WCE's Office of Teacher Education and Outreach sponsored the event.